August is upon us, and after a quick heatwave, this week’s temps are looking very comfortable. This is great news for fish and angler alike. We still have low water conditions in most areas, but this is the norm in August. This simply means we have slightly more technical fishing than the rest of the summer and the daily windows push toward the low light of dusk and dawn. 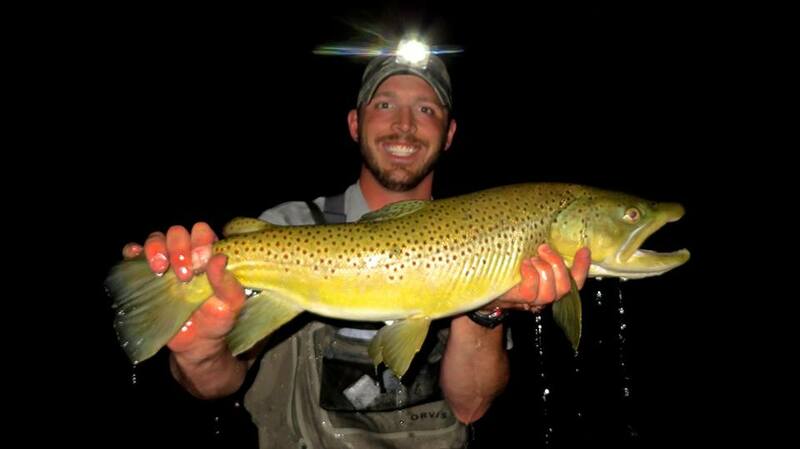 The Trico spinner fall continues all over the Sun Valley area and is fishable on almost all our waters. Silver Creek is the epicenter of the Trico and the mornings when it is not showing in large numbers, other insects and hatches are taking its place. The Baetis has been prolific in the mornings and if you don’t have Hatch Matchers in your fly box, you may be missing the single most important pattern on Silver Creek this season. The P.M.D. activity remains sporadic with some very intense hatches lately. The afternoons on the Creek are still dominated by Damsel Fly activity, although the Hopper action is really starting to pick up. Callibaetis are still the mainstay of fish in the sloughs as well as ants. The Flying Ant action valley wide has been epic this past two weeks and we see no reason it shouldn’t remain our best bug. The evenings on the Creek are the normal smorgasbord of all the bugs, and if you are lucky and stay late enough you can witness the Trico emergence. You’ll know you are seeing it, when the fish are going nuts on what looks like a surface devoid of insects. We also cannot say enough about how good the Mouse fishing is this season. It’s the closest we’ll get to all out “Mouse Hatch” conditions. Elsewhere, the Big Wood continues to fish well early and late. Small mayflies in the a.m. are complimented by decent Caddis in the p.m. If you plan to fish in the afternoon, it’s a Dave’s Hopper with a Pheasant Tail dropper. Streamers have also been effective for taking bigger fish, but anglers need to also use this technique when the light is low. The Lower Lost continues to be great with Trico and Crane Fly activity. This activity, coupled with wadable flows makes for a great experience, but you had better get out of bed early to make the drive worthwhile! We love fishing in August! Dust off your Hopper Patterns and get ready for an epic month of casting flies! Trico time is upon us at Silver Creek! Couple that insect with fantastic afternoon Damsel Fly activity, then sprinkle in some late night Mouse fishing and anglers are set up for some great spring creek fishing! We love that the Trico is happening early this year. The peak activity can be found in the S-Turns on the Nature Conservancy property and by weeks end we can expect to find this Spinner Fall up and down the entire river. When the Trico “feed” begins to taper off, expect to see PMD and Baetis for at least another hour or so before the afternoon lull. Once you are done fishing the morning hatches and spinner falls, come on by Picabo Angler for some lunch at our Grill and the head back out for the banner year of Damsel Fly fishing we’ve been having! If you still aren’t sated after that, look to hang in there until dark and try Mouse fishing. The Big Browns have been eating Mouse Flies better than ever this year! On the Wood and Upper Lost Rivers, the Green Drakes are well up the systems and should be wrapping up for the season by weeks end. Fishing Stonefly and Salmon Fly imitations remains viable on most rivers, especially the South Fork of the Boise where the Salmon Flies are making their way to the dam! This is the week to fish if you want to hit the Salmon Fly on this awesome river. The Salmon River is fishing very well and is another great place to go cast big attractor flies at nice sized Cutts and Rainbows. Floating the river is the best way to fish it. If you don’t have a boat and want to see the river up close and personal, let one of our great guides row you down and put you over these hungry fish. The Lower Lost continues to fish in spots with nymph and double nymph rigs. Wading can be tough, but jumping from spot to spot by vehicle can be productive. Copper Johns are a great way to go, and if you need to fish dries, try skating a Crane Fly. We have some excellent imitations in the store this year. Over all we can expect another great week of fishing throughout the Sun Valley area. Temps should be more comfortable for fish and anglers alike, and the water conditions and hatches are as good as it gets right now!